Believed to be the first Chinese art gallery in America to exhibit and sell classical and contemporary Chinese paintings, Mi Chou was founded by Frank Fulai Cho in 1954 with support from his teacher, C. C. Wang, one of the most renowned Chinese art connoisseurs and collectors of the 1900s. Mi Chou’s exhibitions were unprecedented in style and quality – whether classical, contemporary, or solo shows – and frequently well-received and reviewed in The New York Times, ARTnews, and other important press of that time. 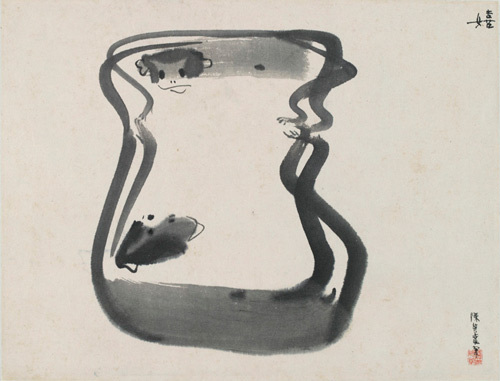 One of the artist’s that the Mi Chou Gallery exhibited and made famous was Chen Chi-kwan (also spelled Chen Qi Kuan). The gallery gave him his first one-man show and introduced his work to Professor Nelson I. Wu of Yale’s Art History Department, who wrote an introductory essay which resulted in much press coverage and the exhibition’s eventual great success. Since then, Chen Chi-kwan’s art is widely collected and recognized by academia, collectors, and the general public. Mi Chou was perhaps the first - but not the only American art gallery to focus largely on ink painting. In California, several galleries opened in quick succession beginning in the early 1960s. These included East Wind Gallery in San Francisco, opened by artist Wang Liu-sang in 1961; the Chinese Art Gallery - also in San Francisco - opened by artist Lim Tching-ai in 1965; and another Chinese Art Gallery in Carmel that operated in the 1960s and 1970s under the direction of artists Yang Ling-fu and later Cheng Yet-por. James Yeh-jau Liu operated the Han Syi Studio as a gallery in Tiburon beginning in 1967. Hungarian American Les Laky also showcased ink painting at the higher profile Laky Gallery, with branches in Carmel, San Francisco and Los Angeles during the 1960s and 1970s. Laky exhibited artists James Yeh-jau Liu, Wang Chang-chieh and Cheng Yet-por, as well as a legendary series of exhibitions featuring the experimental splashed ink work of Chang Dai-chien. Artist Frederik Wong exhibited with Mi Chou Gallery beginning in the late 1950s, and shares his personal memories here. Discussion of "Paintings from the Mi Chou Gallery Collection, Madison Avenue, New York"
Version 25 id 180222 of this page, updated 30 May 2014 by Alexei Taylor. Created by Alexei Taylor. Virtual Asian-American Art Museum Project by Alexei Taylor. Help reading this book.